First open in 2003 by a journalist who has a great passion of Vietnam culture and culinary, Hidden Hanoi restaurant is beautifully set among a lush garden in a quiet road, which is 10-minute drive from the Old Quarter. 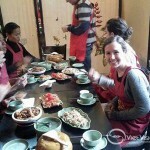 Joining the cooking class at the Hidden Restaurant, visitors will have chance to prepare their own typical Vietnamese dishes before sitting in a pleasant atmosphere to have lunch/dinner. Pick up at our hotel at 9.45, we will be driven to Hidden Hanoi Restaurant. On arrival, we will be welcomed by the restaurant’s staff and chef. We will then go to a nearby market to choose fresh ingredients for our cooking class. 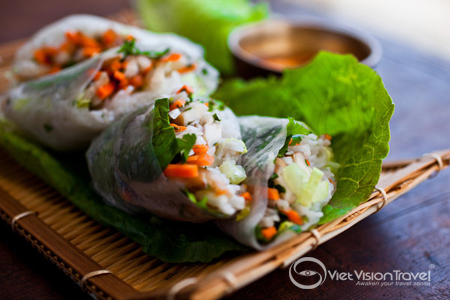 Back to the class at 11.00, we will have a short introduction about Vietnamese culture and culinary before starting rolling in the kitchen to make some typical Vietnamese dishes. We can choose from the restaurant’s 6 menus like: Seafood menu, Monsoon menu, Street food menu, Village menu, Vegetarian menu, Pho menu (specific menu will be confirmed in advance). After the class, we will sit down, have lunch with what we have cooked, and end the tour at around 2 PM at our hotel. Tour ends. Please email to [email protected] for making reservation or Call us at (+84) 43 556 1146 or Ms Jeanny’s phone at (+84) 904 111 770. Love Vietnamese cuisine and still learning how to cook the authentic dishes. Thanks for letting us know about this Delicious Vietnam. I can browse all yummy dishes and learn more. 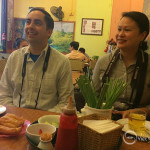 We are planning a trip to Hanoi next month and we really want to try the most famous dish: Pho. Where can I get the best Pho in Hanoi? 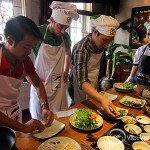 Hi, Pho is one of the most famous dishes and you should try once when you visit Hanoi. Some places are well-known for its best pho bo such as 49 Bat Dan Street or 14 Ly Quoc Su. For pho ga, you can try phở gà at Lan Ong Street, it’s also delicious too. My health is no really fine, I am wondering if the street food in Hanoi is safe or not? The Hanoi street food is really good, fresh and nutritious. And you don’t have to worry about the food. But you should choose the popular food stalls to enjoy street food due to the quality of food. How mostly different between “Pho” Hanoi and Sai Gon? It is said that Pho origins from the North. Hanoians use pig bones to make broth of Pho served with thin slice of beef or chicken, piece of lemon, peppers. Meanwhile, Pho Sai Gon is made from chicken bones, dried squid, and the sweet of sugar so it is slightly fat and tastily rich. Saigonese serves Pho with lemon, fresh pepper, coriander, sliced onion, bean-sprouts. 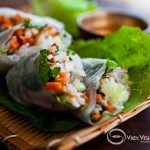 Any restaurant offering vegetarian food in Hanoi? If you are a vegetarian, you can go to some restaurants such as “Nang Tam” restaurant at 17B Hai Ba Trung , Tamarind on Ma May street and others in Kim Ma street.